The JLT is over and we are gearing up for Fantasy lockout. The JLT Series is over. 27 games of data and we have a better idea of where our teams are at – although it has been tough to #StayStrongJLT. Post your team (in an easy to read format) and discuss where it’s at in the comments below. Now that we have My Team cranking, discuss any players, team structure, etc in the comments. As always, keep it civil and if you want advice, make sure you dish out some of your own (make sure it well thought out and not blatant trolling – we’re totally over that after 10+ years of DT Talk!). I’ve gone with Kennedy, but think both are on par with each other. Kennedy & Grundy, or Miles & Gawn? Lachie Neale you’ll have a bird eye view to the 140 I’ll drop on Freo on Sunday. why would I be above the ground? Alert 🚨 Grundy where are you? The Danger is not happy Grundy on 58 it’s 3 qtr time where are youGrundy? Did Grundy decide to go home early if your at the MCG get your binoculars to see if you can see Grundy. Grundy from 58 at 3qtr time to 94 full time you made The Danger happy again with that last quater performance. Not having Adams and Macrae for being to vanilla has killed me already, oh and whe. The Danger has them in his team you see I know Fansty guns when I see them. Brought in Adams and Macrae last minute, glad I did. LMFAO I finished 95th last year how bout you? I don’t know many people that brag about being 95th at anything. 95 outa 120k afl is sensational and I’d be braggin” too. So Adams got 151 The Danger has been saying the past few days he’ll bang out 140 on Freo. Well Mr Adams The Danger will have to step up I will know drop 160 on Freo. If you don’t make 150 delete your team.. They got a big tick from The Danger. Might regret doubting Macrae now, hopefully NRoo pulls out some big numbers. I tried to bring Roo in and couldn’t, stuck in Macrae at the last minute. I have him aswell, hoping he goes 112+ ? 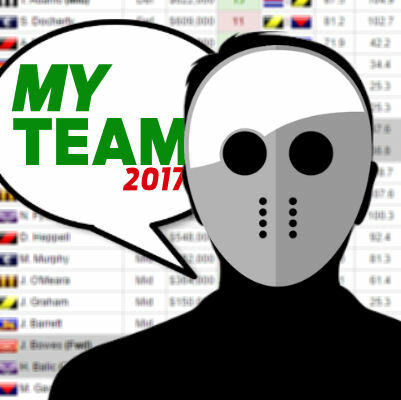 RDT question – Take Treloar’s 125 with the loophole or risk Danger outscores him against Freo? Bringing in Steele Sidebottom for the first time all preseason 5 mins before lockout really paid off!! Was on track for something massive. 772 from 7, 9 play today. Just making sure, price changes happen straight away in fantasy dont they? JSelwood + JSmith or Swallow and ZJones? My buddy Joel is a Fansty gun like my self also picks up them free kicks for ducking. He is the ducking king. The Danger will get a good night sleep to night. So tomorrow is already to drop 160 on Freo I am the Fansty Football gun. Looks like Roo > Macrae will be my first trade…. Stretchered off with some sort of knee injury, looked to be in pain, at least a hyperextension.Did see some vision and he was walking “okay” in the rooms. Happened with about 8-10mins left in the 4th. Have to eat Pickets 30 Mark.? all good, marathon not a sprint. Either, they’ll both be in the tops of their positions. Who’s your there ruck? I just want to know who rocky thinks he is?? rocky or something? He is the Fansty gun like myself. gawn, macrae or cheaper miller?? Anyone have Hanners? and think about trading or holding? This is my side before trades… Thinking of doing GHS > SPP and Taranto > Balic and then move Houston onto the field, Thoughts… Anything you would do different!? Leaves me 94k for next week.